Knitters who already love knitted felt for its softness and durability take their skills to new heights with these wonderful projects for garments, accessories, and home fashions. 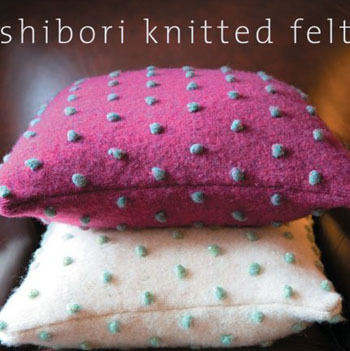 By incorporating Shibori, the Japanese art of manipulating fabric to create unusual textures and color effects, these projects delight with their fanciful bobbles, pleats, ruffles, and embroidery stitches. Designs include a delicate frilled scarf embellished with beads, a pair of Turkish shoes, an embossed throw, a pleated cape, a water-bottle cover, and a striped "bump" bag made by tying marbles into the fabric before washing to create a bubbled texture. A guide to felting basics, lists of yarn types and equipment, and washing-temperature charts to ensure exact shrinkage are included, and beautiful photographs, step-by-step instructions, full-color illustrations, and sidebars filled with tips and techniques make the projects easy to envision and complete.